PrimoAgents get an exclusive offer with Binding Systems of America.Below is a summary of their services. Our members get the complete package of 100 covers printed in 4-color for $389 US instead of the regular price of $598 US. A few Real Estate Agents from the same area can group together to divide the price between them. BSA is a specialty printer and currently produce CMA covers, Presentation and Pocket Folders for many real estate offices in your area and across the country including Re/Max, Realty Executives, Harry Norman Realtors, Sotheby’s Real Estate, Berkshire Hathaway HomeServices, Douglas Elliman and Coldwell Banker to name a few. 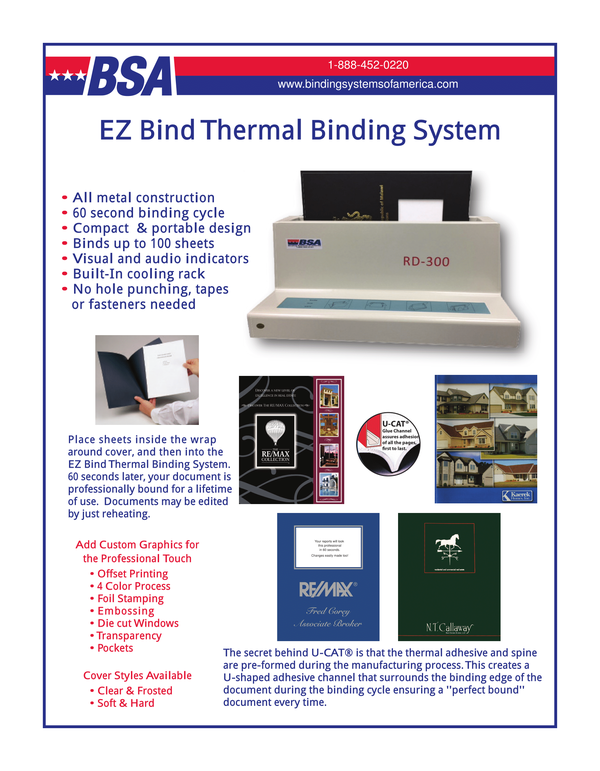 BSA is the leading US manufacturer of Thermal covers for any heat binding system. These companies use thermal to bind their CMA’s and listing presentations. Thermal Binding creates a finished and bound look similar to book binding without the cost and I would be happy to send you some samples! They specialize in custom Foil Stamping, Embossing and Offset Printing for any type of cover or folder. They have many different styles to choose from, including 2-piece cover sets for any punch and bind system like Plastic Comb, Coil, Wire and Thermal Tape as well as custom printed tab dividers. If you’re looking for a binding system, they can help you navigate all of the options and help you make the right choice for your presentations. For any questions about BSA, contact Arlene at aschulman@bindingsystemsofamerica.com.